10% OFF ALL TAKE OUT ORDERS till the end of APRIL, 2019 only. Not applicable to Skip the dishes orders, or any other promotional offers. Mention “Mango10” (at the time of order) to receive your 10% off your next take-out order. 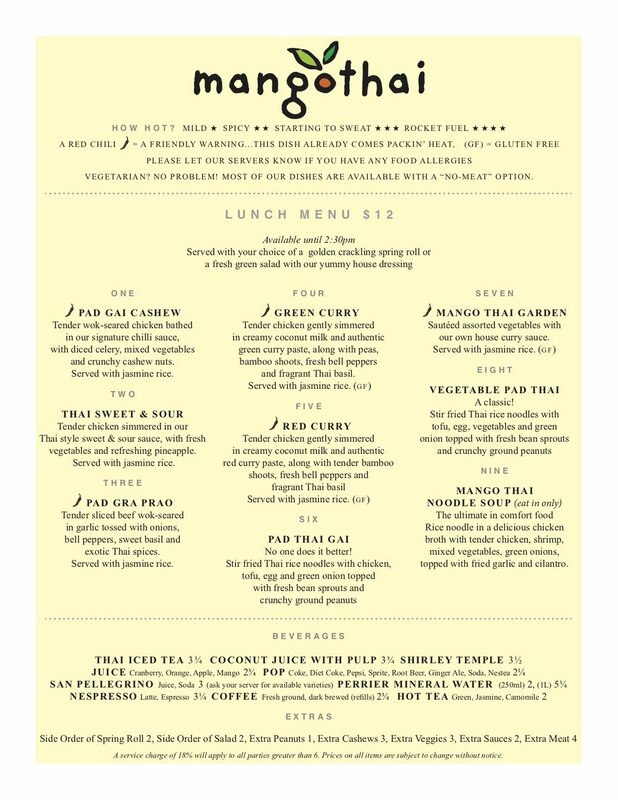 LUNCH: We took the approach to offer a limited lunch menu with excellent value options for some of our most popular Thai meals. Most of the meals offer a choice of a side salad or a crunchy spring roll. Lunch specials are available every day till 2:30 p.m.
DINNER: At dinner we offer a full menu, offering many of Thailand’s favourite dishes. Be sure to try one of many delicious Thai curries, or settle for the infamous Pad Thai. We know once you try a Mango Thai dish…you will be hooked. Use Open Table below to make a reservation. This service is available at no charge to you. OFF THE MENU…. Have a special request that we don’t have on the menu. No problem. We can accommodate. Ask the chef to prepare your favourite Thai creation. We are best available to accommodate you during the evening hours. (granted that we have the time and ingredients available). We will do our best to accommodate your “special off the menu requests”. Looking to take out. Phone in for your take out order. Or if you really want to relax….order your delicious piping hot Thai meal delivered right to your door with Skip the Dishes. Experience the best Thai food in Langford!